Adult roseate spoonbill exercising its wings in a brackish impoundment at Merritt Island National Wildlife Refuge, Titusville, Florida. nd colorful as the bird matures. Plume-feather hunters beginning in the 1830s decimated historical populations, but disturbance at shared rookeries for the highly prized plumes of egrets probably took the greatest toll on the species. 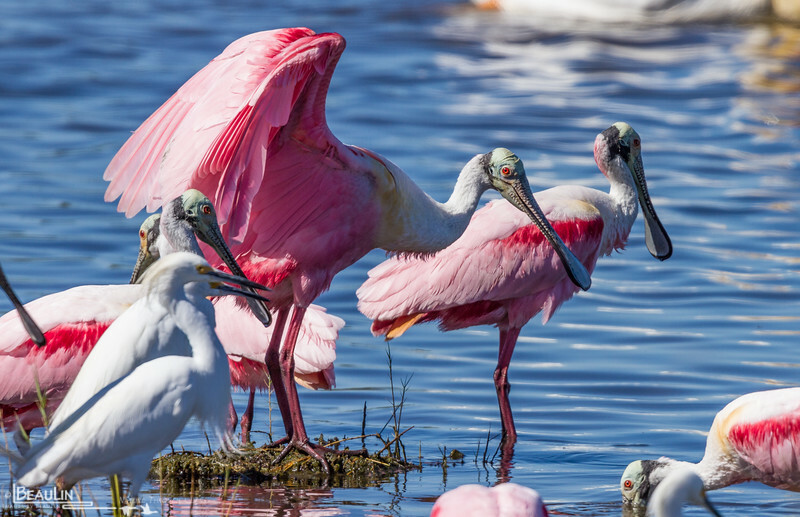 Like all other spoonbills, this species frequents shallow aquatic habitats and feeds by swinging its head and the slightly open “spoon” of its bill in the water from side to side in a semicircular motion. The bill snaps shut when it contacts prey, mainly fish and aquatic invertebrates.